L – is for the way you look at me…O – is for the only one I see…Ok I cannot get that song out of my head! These stamps just scream for lovey dovey-ness and today Wplus9 is not only debuting one….but holy moly…TWO cooridinating stamp sets!! AMORE!!! These two sets just belong together…much like soulmates…tee hee!! 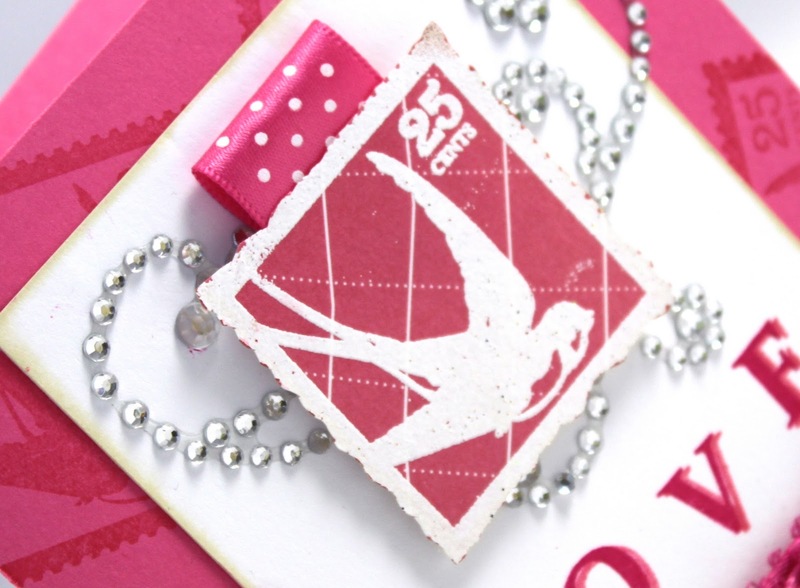 For my card today I started with a fun & funky scrap of pink textured patterned paper I had in my stash. I knew I wanted to showcase the beautiful swallow bird stamp image right away. I stamped it with Versa Mark on the patterned paper and heat embossed it in white. I fussy cut it out and ruffled the outside to give it a shabby chic effect. I then grabbed some corresponding pink card stock and cut it card size and stamped it with pink ink with the same image to create a fun patterned paper behind it. Grabbed some white card stock and used the L-O-V-E (separate letters) stamps to create a fun sentiment with two tones of pinks. Punched the bottom edge of the white card stock and added some glorious platinum bling! 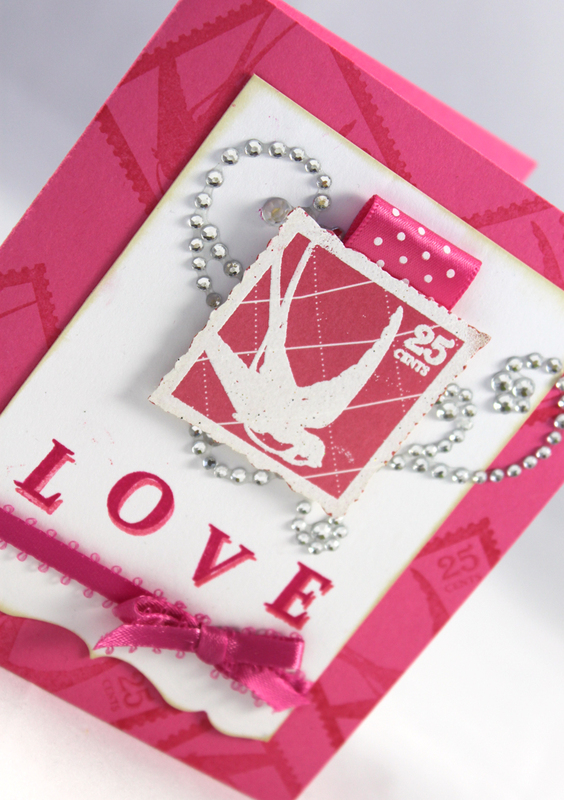 Topped the stamp image with a pink polka dot ribbon pull and popped it onto the white. What do you think? This card is a little out of my usual style – but I’m LOVING it! I love when I get a little crazy and the final result is so much fun 🙂 That truly is the best party about my “creative therapy” There are no rules and no wrong ways! Make sure to check out what the rest of the Wplus9 DT has come up with for these stunning stamps! 'Cause LOVE was made for you and meeeeeeeeeeeeee! YIPEEEE!This card puts the HOT in p-i-n-k, my friend! ABSOLUTELY gorgeous! The crisp of the white and the accent of bling + DAWN'S STAMPS! Fabulous! Fun to see your take on it, great job. Wow what a sweet card! Lots of steps but worth it every bit of the way! I just love that Postmarked stamp set! Super fun, Kerrianne! 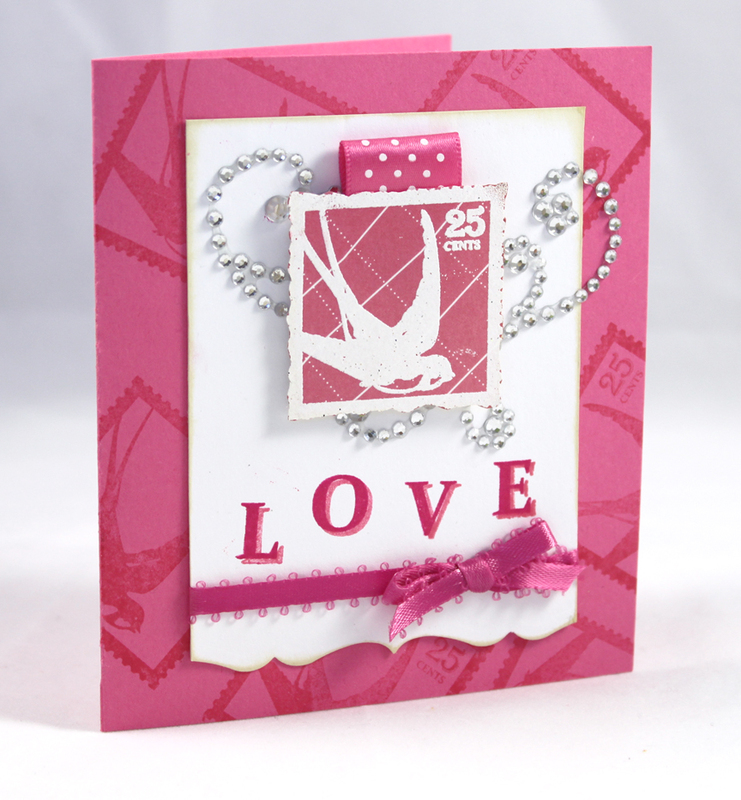 I adore your focal point and the way you carried your stamped images right to the card base! Fantastic! What a fun card, with those bling! And gorgeous, too! Pretty pink card! I do love these sets! !